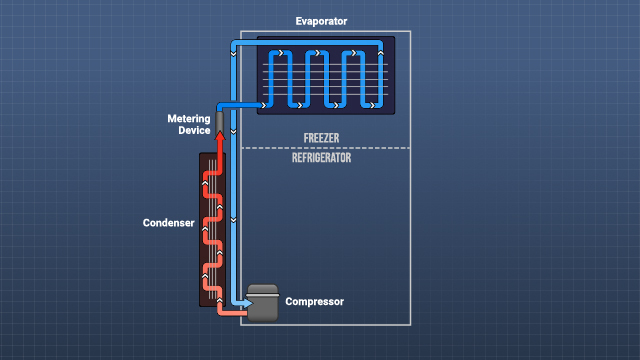 The refrigerant continuously flows through an evaporator, compressor, condenser, and metering device. 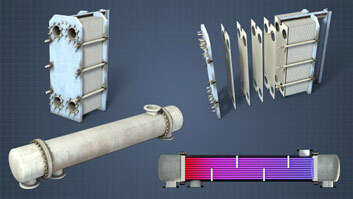 The evaporator and condenser coils have fins, just like small engines, to facilitate heat transfer. 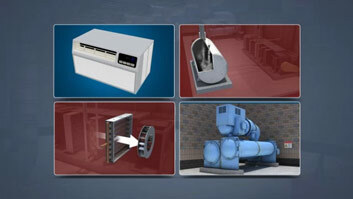 On your refrigerator, the compressor coils are usually located on the back or bottom. A vapor-compression (or mechanical) refrigeration system has four main components - an evaporator, compressor, condenser, and metering device. 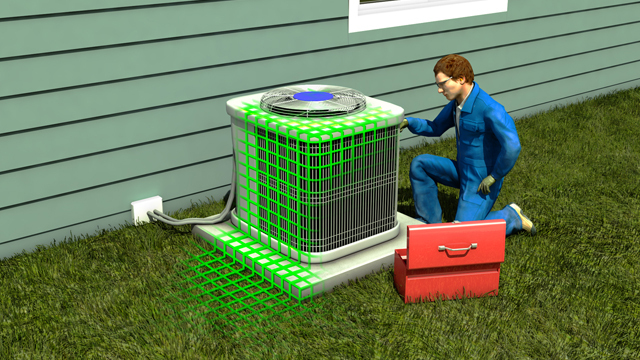 During operation, the refrigerant circulates through these components, alternately changing phase from a liquid to a gas, and from a gas to a liquid, as it absorbs and releases heat. Thus, using only the power supplied to the compressor, the refrigerant is used over and over again to move heat from one area to another. 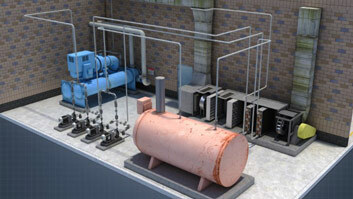 Why is the evaporator called an evaporator, and the condenser a condenser? They are named for what happens to the refrigerant in them. The refrigerant evaporates (changes from liquid to gas) in the evaporator, and condenses (changes from gas to liquid) in the condenser. 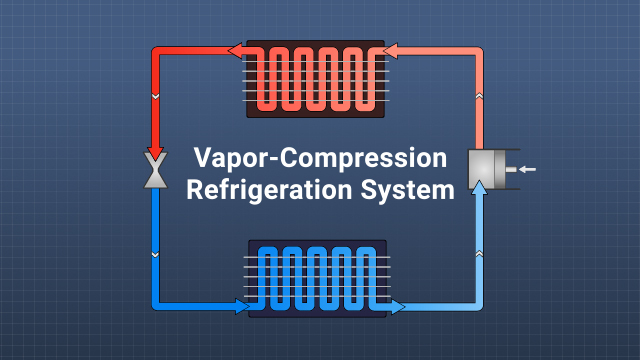 Isn't there an expansion valve in a vapor-compression refrigeration system? The name reflects the fact that this component regulates, or meters, refrigerant to the evaporator. These devices are often, but not always, expansion valves, which is why they are called metering devices in this module. Metering device is more generic. What is the purpose of the "superheat spring" in a thermostatic expansion valve? This often factory pre-set spring ensures that all of the refrigerant changes to a gas before it reaches the compressor to prevent slugging. If a refrigeration system moves heat from one location to another, where does my refrigerator at home release its heat? In household refrigerators, the refrigerant absorbs heat inside the refrigerator and then releases it to the surrounding air. 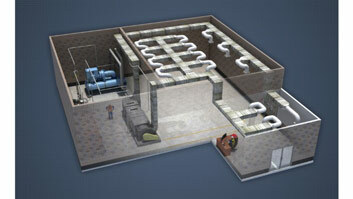 This takes place around the condenser coils, which are usually installed behind or under the refrigerator. Why does my refrigerator sound like it is running sometimes and then it turns off? This is how your refrigerator controls temperature. When the inside temperature gets too warm, the compressor turns on and the refrigerant removes heat. When the temperature drops low enough, the compressor turns off. The refrigerator will slowly warm up until the compressor turns on again. Another common metering device is the thermostatic expansion valve (TEV or TXV). 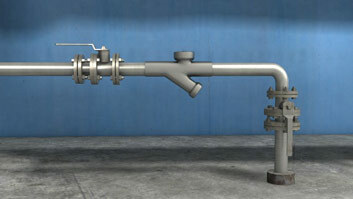 This type of valve regulates the flow of refrigerant into the evaporator based on how quickly the refrigerant is being vaporized in the evaporator. So, it is better able to handle changes to the thermal load on the evaporator. A thermostatic expansion valve works by balancing four forces. The incoming liquid pressure (created by the compressor) and the force created by a built-in diaphragm (which varies with the temperature of the refrigerant gas in the suction line to the compressor) both work to open the orifice in the valve, while the evaporator pressure and the pressure created by a built-in superheat spring both work to close the orifice. 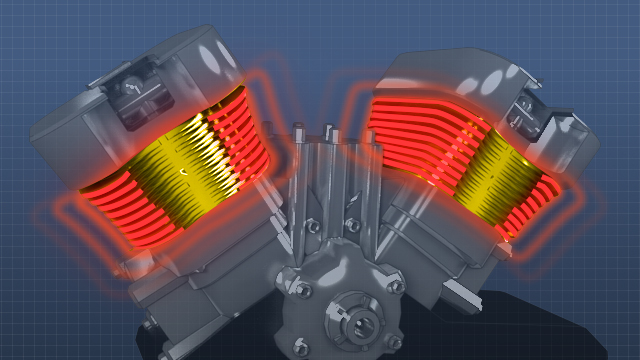 The orifice opening ultimately determines the flow of refrigerant into the evaporator.